Winner of a 2012 ASCC Decorative Concrete Council Award - First Place Certificate for Concrete Artistry, Over 5000 SF. 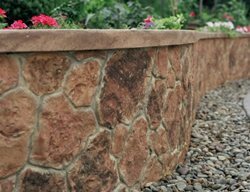 Pictured are Lithocrete Sedimentary walls and Lithocrete hand seeded walkways with a decorative waved buff wash. These elements are part of a pedestrian bridge project with a natural systems design theme. The wall and paving together were designed to represent a meandering river’s flow. 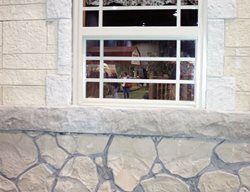 A variety of rocks, pebbles and aggregates were used in both the walls and paving. 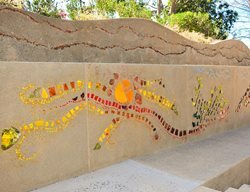 The walls were poured in layers with locally harvested rocks and pebbles placed in between each layer. 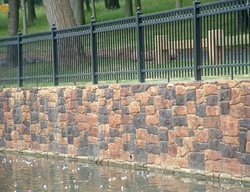 Hubbard Park, Mirror Lake renovation in Meridan, Conn. Sim Stain colors used: red, black, rust. Some colors were combined to get a variation. Poured in place vertical concrete retaining wall. Two colors of concrete were poured with rocks in between to create organic voids. Detail carving on a roman aqueduct theme in a Southern California backyard pool. Read about this vertical concrete project. 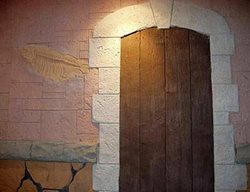 This is a Roman Aqueduct recreated for a client in Southern California. 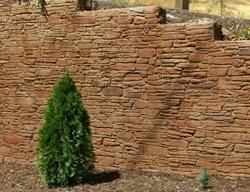 Theme construction is becoming very popular in private residential landscapes. This design took at least six months to come up with and to make it look right in this situation scale became an issue. We did not want it to become too overpowering. You will also notice the shape of the pool is curvilinear while the ruin walls are symmetrical. Making the two work together was a real challenge. Because of good planning it worked out well. 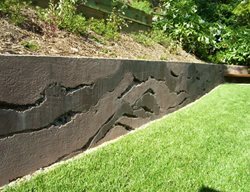 This wall received an overlay application using a vertical mix which was stamped and hand carved and stained. The cap was a cast in place application that was color hardened with cream beige and walnut release. 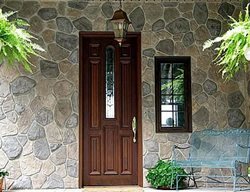 The texture of the cap is seamless Bluestone. 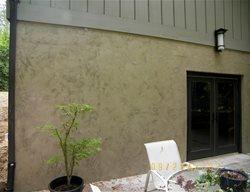 This wall was made with a vertical concrete overlay. 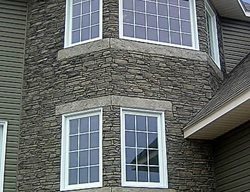 Color and pattern were added to give the appearance of stone. Vertical handcarved concrete outdoor kitchen. The countertops were cast in place with a light stone texture and profiled edges. The stones were individually carved and colored so that no two stones would look alike. 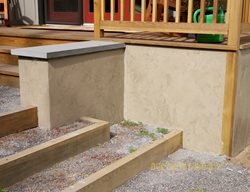 Products used included: Tru Pac-V by Contractor Source and Kirk Bag mix. Texturing tools and edgeliners were from Contractor Source. Countertop mix was proprietary with added Counter Flo.